Two articles, one published in the “Astrophysical Journal” and one in “Astronomy & Astrophysics”, describe two researches on a number of star systems. 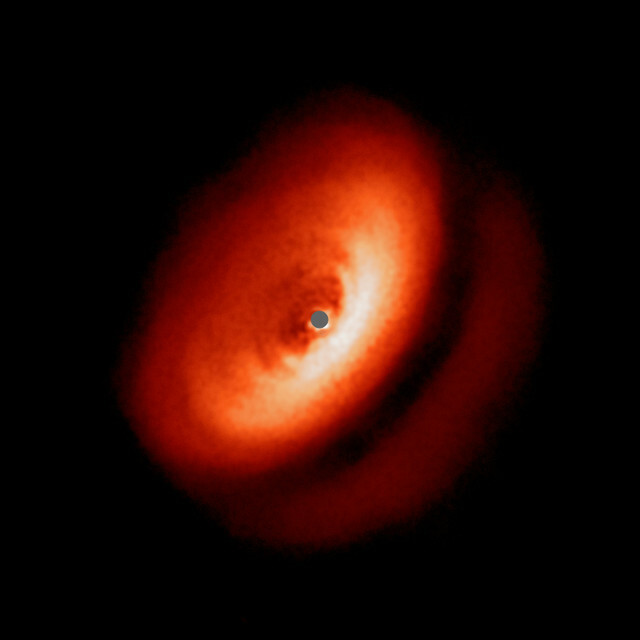 Two teams used the SPHERE instrument mounted on ESO’s VLT in one case to study dust and gas disks around a number of young stars in their formation stage and in the other case to study a pair of disks in a system with three stars. The SPHERE (Spectro-Polarimetric High-contrast Exoplanet REsearch) instrument, activated in June 2014, is above all an exoplanet hunter but can also take direct images of protoplanetary disks around young stars in which new planets are forming. For this reason, it was already used more than once in this type of research, for example in November 2016 three articles published in the journal “Astronomy and Astrophysics” described as many researches on systems in formation RX J1615, HD 97048 and HD 135344B. A specific investigation was performed on stars of a type called T Tauri and for this reason called DARTTS-S (Discs ARound T Tauri Stars with SPHERE). Their age is less than 10 million years so they’re still surrounded by rings of gas and dust in which planets are forming and planetesimals, the “bricks” from which the various celestial bodies form in a star system. The young stars included are between 230 and 550 light years from Earth so from an astronomical point of view they’re in the neighborhood. 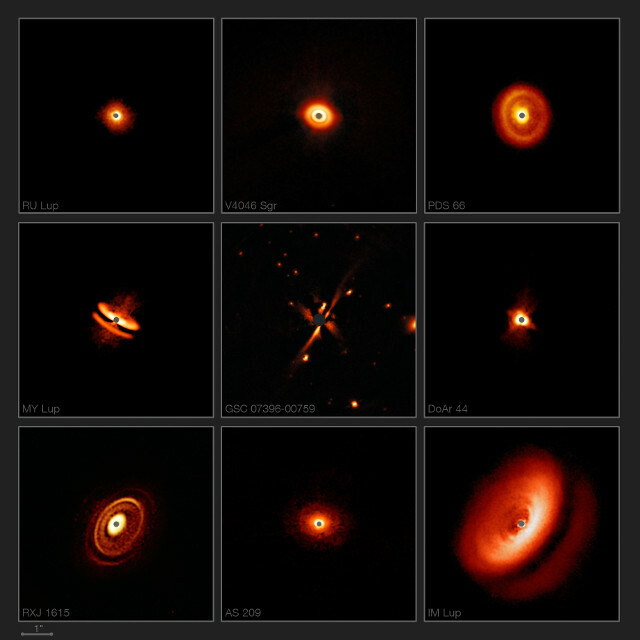 Previous researches, conducted using both the SPHERE instrument and other telescopes such as the ALMA radio telescope, allowed to notice the various shapes, sizes and structures existing in the various star systems in formation. Their ages are different so they’re in different stages of their evolution and the different sizes and densities of the protoplanetary disks will lead to the formation of a different number of planets with varying sizes and masses. In the article submitted to “Astrophysical Journal” a team led by Henning Avenhaus studied 8 different systems among the ones observed with SPHERE within the DARTTS-S survey. In five cases, the researchers were able to determine the 3D structure of the disks, but there’s still a lot to discover, so much that for example no correlations between disk structure and age have yet been found. In the article submitted to “Astronomy & Astrophysics”, a team led by Elena Sissa of INAF in Padua, Italy, focused on the GSC 07396-00759 system, where a disk of gas and dust orbits around a red dwarf. The peculiarity is that it’s part of a system with three gravitationally bond stars. The other two stars have a disk in common in a binary system called V4046 Sgr. The interesting thing is that the disk of the V4046 Sgr pair is mainly composed of gas while the one of GSC 7396-0759 is composed mainly of debris. 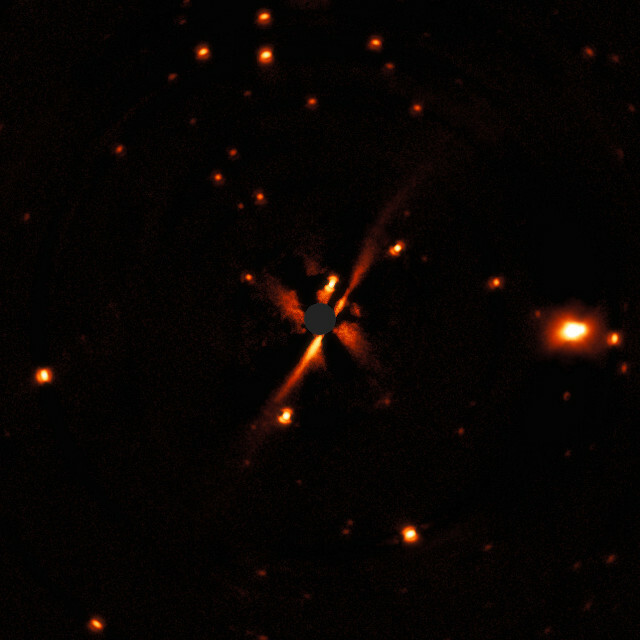 This indicates that the disk of the V4046 Sgr pair is in an earlier evolutionary stage even if the two systems were born together. The reason for this difference is not clear but single stars and binary stars’ systems could have different evolutions and that’s a reason of interest for astronomers. The GSC 7396-0759 system was discovered by the SHINE (SpHere INfrared survey for Exoplanets) survey. The nearby stars were already known but their “sibling” and its disk weren’t detected by NASA’s WISE space telescope, probably because the star has a relatively low surface temperature. These new researches are confirming the great possibilities offered by the SPHERE instrument. In recent years, astronomers are discovering more and more star systems intheir formation stage, enabling them to study them directly and test models that for decades were only theoretical.